The Z88 was built by Cambridge Computers, Sir Clive Sinclair's company after Sinclair Research was taken over by Amstrad. 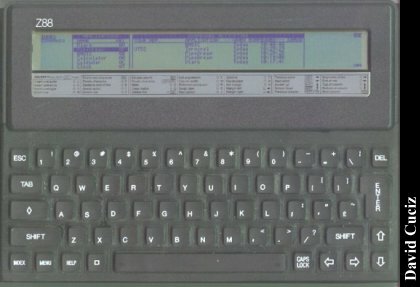 This laptop, apparently the only machine built by the new company, is testament to Sir Clive's brilliant mind and originality. Powered by 4 AA cells, the Z88 is built around the Zilog Z80 CPU, clocked at 3.28 MHz; it's outfitted with 32 K of RAM (expandable) and 128 K of ROM. The operating system and built-in software is contained in ROM, so applications do not require system memory to run; extra applications can be loaded through the 3 cartridge ports under the machine; more memory can also be added through the same ports. The display is a 640 X 64 monochrome LCD screen capable of displaying 104 columns X 8 lines of text; 3 shades of gray are also displayable. 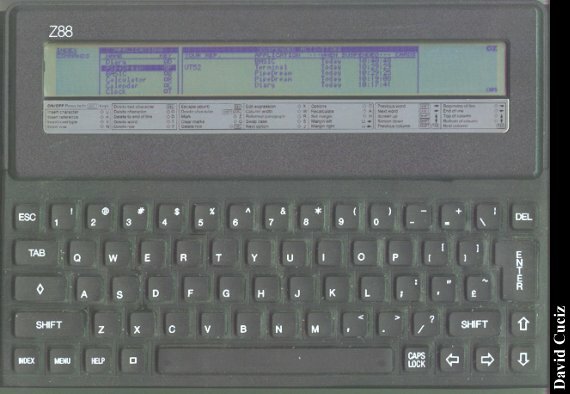 The Z88 operating system is named OZ - I don't know of any relations with the more renown Wizard - and it is a fast and efficient menu-driven environment; although it cannot support multitasking, task-switching works effectively and transparently, allowing the user fast transition between many working sessions without the need to close any of them. Applications and options are accessed through menu keys or shortcuts. 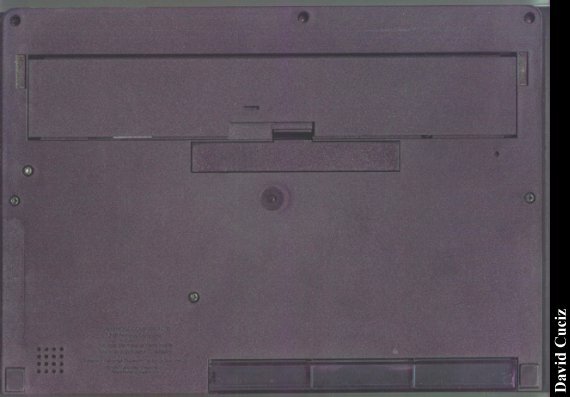 On the underside of the computer lie the battery compartment for the 4 AA cells; a strange contraption that, once unfolded, turns into a support to hold the laptop at an angle to facilitate typing; and the cartridge ports. There are three of them, two for RAM expansion and one for EPROMs. 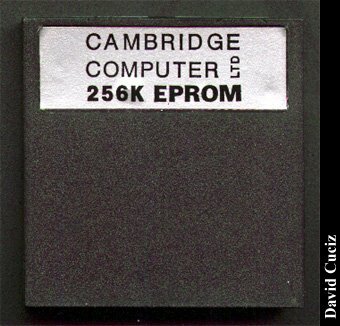 Since the Z88 does not use disk drives or the like, mass storage is provided by an EPROM slot: data are written on EPROM cartridges, from where they can only be erased by a dedicated device which fires UV light on a circular "window" on the backside of the cartridge. The EPROMs store data indefinitely. The left side of the Z88 features the contrast adjustment knob, the well-protected RESET button and the DC port. The right side only features the serial/parallel port. Diary:	a kind of a PDA program, intended for entering "to-do" lists, daily schedules and so on. PipeDream:	this cunning piece of software combines a word processor, spreadsheet and database into one package. The wordprocessor files can be exported to a PC via the serial port (more of this later) and converted into Windows-readable format. The spreadsheet is well-featured and supports scientific, trigonometric and financial functions, as well as logic operators. The database can be easily tailored for use as a phonebook or the like. BASIC:	This is a version of BBC Basic, minus the graphical and sound functions. Though interpreted, and hence not very fast, BASIC comes into its own when you need to write an application on a need-	it-right-now basis. Calendar:	The name says it all - but you can link it to Diary to have time-critical data recalled. Clock:	Time and Date. It's also used to set the system date and time. Alarm:	Through this application it is possible to set different alarms with different times and dates. You are not limited to set an audible alarm: a program can also be launched from here at the desired time. Filer:	The file managing tool. PrinterEd:	A printer control code editor. How many computers do you know that allow you to write your own printer driver? Panel:	The settings control panel. This allows the user to set different parameters, such as transfer baud rate and parity, date format, insert/overtype mode and so on. Terminal:	A VT-52 terminal emulator. Imp-Export:	The file transfer utility. The Z88 is also programmable in Z80 Assembler language, and dedicated enthusiasts have written applications for it, many of which are available on the Internet. This A4-sized, lightweight black box is far more powerful than it looks like, and it can run for days on its power cells; for simple computational work and word-processing it's the ideal machine. I wanted to add a little to David's excellent information. I managed to get my hands on one of my own. (No pictures yet, but soon.) Three things really strike me about this little guy. Second, there's no power switch. You turn it on and off by pressing both shift keys. Which really works great, if you've read the instructions. (They're right there under the screen, but still, who reads instructions?) Definitely funky, which is good in my book. Third, David wrote a little about the software, but I have to say that PipeDream is one of the coolest programs I've ever seen. It's basically a spreadsheet, but you can also create documents with it, as well as do complex sorting, all in the same document. It's amazingly flexible and perhaps the perfect all-in-one tool for a tiny laptop like this. Plus, on the far right side of the screen lies a mini full page view of the document on which you're working! Cool! Click here to view all comments for the Cambridge Z88 and to leave your own. 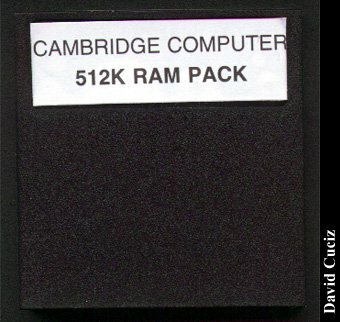 Click here to view comments about other Cambridge computers.